From jupitermusic.com: .462" bore, 10" bell, lacquered brass, nickel silver pistons, trumpet style, includes adapter for horn mouthpiece, weighs 3.3 lbs. The Jupiter 450L features a rather gradual bell flare that enables the instrument to produce a rather dark timbre. However, this flare design also creates other intonation issues. An opportunity to play test a Taiwanese mellophone doesn't come around that often. So, during a trip to Woodwind and Brasswind in South Bend, Indiana, ample time was set aside for a brief sitting with the Jupiter 450L. The time with the instrument helped to dispel any preconceived notions about the economy-priced mellophone. The design of the Jupiter 450L incorporates a rather gradual flare, somewhat similar to the design incorporated into the Yamaha YMP201. 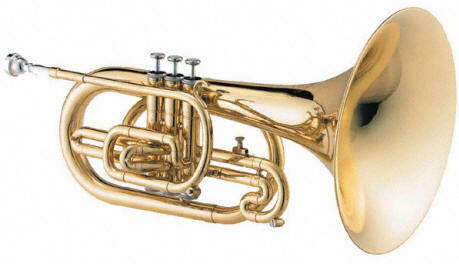 This design yields a pleasing, darker tone quality, but in the case of the Jupiter 450L, it creates intonation issues around the fourth and fifth partials, a critical area for an F mellophone. Subsequently, the fourth space E is a bit sharp (a rather unusual attribute for this sort of instrument). The piston valves are generally good and the spring resistance for the top-sprung valves is less stiff than generally encountered, making the valves somewhat mushy. Additionally, the valve taps are slightly rounded, as opposed to the flat or even concave valve taps that are commonly encountered. There's a rather small area available on the Jupiter 450L for the left hand near the valve cluster. The balance of the instrument is excellent and the instrument feels light in the hands. 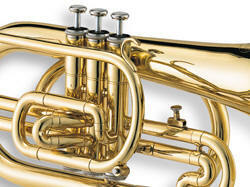 Ergonomically, the instrument has narrow space for the left hand as it grasps the valve cluster. Overall, this is a very serviceable, cost-effective mid-voice alternative appropriate for ensembles with serious budget constraints that need new mid-voice metal. Available at the Woodwind and Brasswind.